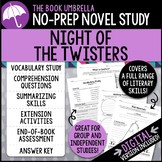 Night of the Twisters by Ivy Ruckman: A Complete Novel Study! Night of the Twisters, by I Ruckman, Complete Literature Unit ~ 71 pgs. 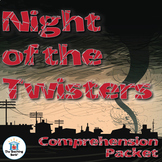 A set of multi-layered, short answer comprehension questions to go with the book, "Night of the Twisters", by Ivy Ruckman. The chapters are clustered together in 25 page sets (approx.). 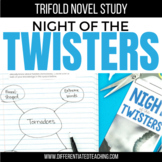 A set of 8 project challenges to accompany the book, "Night of the Twisters", by Ivy Ruckman. These challenges are designed to get students to do research, creative, and expository writing activities. This is a great way to differentiate and integrate other subjects into reading. 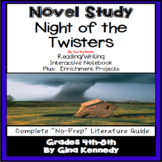 A set of 40 Battle of the Books questions for the book, "Night of the Twisters", by Ivy Ruckman. There are 20 "In the book..." questions and 20 "In which book..." questions, all 40 come with answers and are laid out in an easy to use card format. 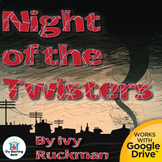 This PowerPoint is to introduce the novel "Night of the Twisters" by Ivy Ruckman. It's a story based on true events when multiple tornadoes occurred in Nebraska in 1980. The PowerPoint includes a map of Nebraska, a map tracking the REAL tornadoes paths in town, a Fujita Scale and photos from 1980. A short answer test for the book, "Night of the Twisters", by Ivy Ruckman. There are 12 total questions, all are in a multi-layered, short answer format.